We chose this cruise specifically for three reasons: first, timing = during spring break, second, theme = Dreamworks cruise for our children&apos;s first cruise, third = price, the ship and itinerary seemed to offer more for the money than others at the same time. Here&apos;s the abbreviated review. Part One – Florida First stop Ft. Lauderdale. Our driver picked us up promptly after collecting our bags and had three car seats already installed in the van for our drive from Miami to Ft. Lauderdale. Francisco of FG Car Services was fabulous and we used the same service from the hotel to the port a few days later, three car seats included. We checked in at the Westin Ft. Lauderdale Beach Resort at 7am and because we had already advised them about our situation, they were very accommodating about the early check-in time. In fact, they upgraded us to a corner room with larger accommodations and a pool view and a beach view, and the room was ready. One really great feature of this hotel was the beach access skywalk from the pool to the ocean which meant that the little ones didn’t have to cross the busy A1A (Beachfront Avenue!! for those of you hearing Vanilla Ice in your head). Part Two – The Ship Francisco, the driver who provided our ground transportation from Miami, sent someone to pick us up on Sunday morning and drop us at Port Everglades. We paid $150 for both services, plus tip. It may seem like a lot, but it turned out to be a bargain, because on both rides, three car seats were included and already installed, which is always a dilemma when traveling with little ones. And, our timing was challenging, considering we arrived at 6:05am on Thursday morning at MIA and our hotel and the port were in FLL. Then, on Sunday morning at the port, the driver knew some super-secret-shortcut that bypassed the long long long line of fellow cruise passengers. He dropped us off right where we checked our luggage and all we had to do was walk into customs. It was very convenient, especially when schlepping 3 kids and 3 bags, so all in all, money well spent. Royal Caribbean’s Allure of the Seas 7-night Eastern Caribbean. Check in was long, but not terrible. Royal Caribbean’s Allure of the Seas, is after all, the second largest cruise ship in the world. There were some 4,000 – 7,000 passengers and crew to board, including us. We were very lucky to have two connecting rooms. We probably wouldn’t have had nearly as much fun crammed into one. Doable, yes, but with three little ones, not such a pleasure. Definitely check out this ship’s reviews online and keep reading for my deck-by-deck description. It’s incredible. 18 decks, 7 “neighborhoods”, and 25 dining options. We chose it as our first family cruise specifically for the children’s features. It was a DreamWorks-themed ship. Think Disney experience, but substitute the DreamWorks characters. We did it all and want to share it all so that you truly know if it’s right for your family. So, the review: we know the children are at the ideal age for interacting with characters because Disneyland and Disneyworld are two of their very favorite places on the planet. And, because the DreamWorks movies are some of their favorites too, we took a chance. It paid off. They met Shrek and Fiona and Puss in Boots, as well as the Penguins, Alex the Lion, Gloria the Hippo, and King Julian from Madagascar. They met Po from Kung Fu Panda and saw Toothless and Hiccup and Stoic and Astrid from How to Train Your Dragon. We paid a small upcharge for the character breakfast and they loved the menu and the extended time with the characters. There were two fantastic parades during the week, one at the beginning of the cruise and one near the end. THM Tip: Don’t miss the parades. Definitely camp out on the level above the parade in the Focus photo gallery at the top of the spiral staircase on deck six if it’s available. It offers a prime vantage point where you can see the parade from from one end to the other. There were character meet-and-greets during most days onboard at several times throughout the day. THM Tip: Request information in advance for your favorite characters. For example, we were given the two times Poppy and Branch would appear, and we took full advantage of that insider information so that we could be first in line both times and it was worth it. There was a movie theater onboard which showed many DreamWorks movies in 3D and there was a DreamWorks channel in the stateroom which showed DW programming in a continuous loop. That was a big deal during rest time. We attended the Madagascar Aqua Show and the How to Train Your Dragon Ice Show. All of these activities were perfect for our children and greatly added to the value of the cruise. Like visiting a Disney park, it’s expensive, but totally lives up to the hype. It’s so worth it as they are only little once. Our itinerary was the 7-night Eastern Caribbean and here’s what we did day-by-day: Day 1 – Embarkation, Fort Lauderdale, Florida We were onboard by about 2-something-pm, which meant the whole check-in rigmarole took a couple of hours. Not bad. The kids know travel security is serious business and handled it all pretty well. THM Tip: Do as much prep as possible about the boat, about your itinerary, about the boarding process, etc. You must complete all documentation in advance. You’ll be glad you did. You need passports for every member of your family and you need reservations in advance to the shore excursions, dining, and activities that are your top choices. There are simply too many people onboard to “wing it”. We didn’t notice the volume of people or feel competitive at any time, but again, we had our game plan thoroughly mapped out in advance. We signed up for First Night Done Right, which is basically a way to pre-book your first night’s specialty dining at a discounted rate. We were matched with Giovanni’s Table, an Italian restaurant in Central Park. Yes, Central Park, by far, my favorite feature of the ship. On deck 8, there was a real open-air park, complete with trees and a path for strolling among the specialty restaurants and shops. Our connecting cabins overlooked the park from deck 9, where we had category CV, Central Park View Staterooms. It was delightful to be able to have natural light in the cabin, but not a balcony (by design as this mama didn’t want to be on high-alert at all times about her little monkeys), and overlooking the park was such a treat. The kiddos enjoyed the window seats too. I thought the park would feel more gimmicky than it did and even though it did have park sounds piped in, it was still a pleasant surprise all around. So was Gionvanni’s. It was our only specialty restaurant (which meant an extra charge), but it was worth it. With little kids, we don’t always get out money’s worth at expensive restaurants, but it was so nice to discover the park the first night and enjoy a special meal without having to figure out the cafeteria or main dining situation. Before dinner, we explored the ship, toured the kids club, and signed the kids up for classes and babysitting, two things you are required to book onboard. Day Two – Nassau, Bahamas We booked the Atlantis shore excursion for the family. This was a reconnaissance tour as we are considering a multi-generational family trip to Atlantis and wanted to know if it makes the cut. It did and didn’t. In short, I think it would be a great fit for teens (lots and lots and lots of water action) and gamblers, but others might get a little bored after a couple of days. It’s basically a super-sized Vegas casino, but on an island instead of the strip. Shuttles picked us up at the port and dropped us off at Atlantis where we had a guide to the resort and about a 3 ½ hour tour which included the archaeological ruins, the underwater tunnel, and the marine life. We brought the strollers so all three could ride and they enjoyed it. It was a lot of walking so keep that in mind if you have mobility issues. The guide was really great and picked the twins to be the leader of our group of about 20 so they got a kick out of rushing to the front each time. We didn’t opt in for waterpark access this time as they are a bit too small for the dramatic water slides and deep water. It looked really fun though. It was hot, but not too hot, and it was a nice mix of indoor and outdoor sightseeing. That evening and back onboard the ship, it was formal night. THM was excited because our son would be wearing his first tuxedo ever (ordered from Zulily) and the girls had matching black gowns with gold swans (from Target). They were so cute and loved dressing up! We thought it could go either way, but all three loved the attention and the special-occasion-feel of the evening. We reported to the American Icon main dining room on deck three, but they upgraded us to the fifth-floor dining. The main dining spans three floors and you are assigned one, but all have a slightly different appeal. Service and menus are standardized. A dining aside: We participated in My Time Dining. This means we didn’t have a set time or table to dine at each night (which would be necessary if you were a big group). We appreciated the flexibility for the kiddos and never had a long wait. We also enjoyed trying different options and eating when it suited our itinerary. We had the same maître de on some nights and they were accommodating to the children. While THD put the twins to bed, the little one and I went to Mamma Mia! She wasn’t 100% convinced she liked cruising by this point and would not let Mama go alone, so I didn’t see the entire show (only about a third of it really before she lost interest), but it was fun. Nice production value, strong voices, and a fun high-quality performance. I would have liked to see the entire production. Day Three – Sea Day It was nice to sleep in after the previous day’s early start and full agenda, so we ate and explored the ship some more. I shopped a bit and popped into the casino. The casino was a bit underwhelming. It had your usual mix of slots and table games, but there wasn’t a lot of energy or excitement the times I dropped in. Although I did see a woman win $1,300 and was very excited for her! All five of us watched the Trolls movie in 3D and loved it just as much as we did back home and when we got to meet Poppy & Branch later that day, it was the icing on the cake. That evening while the twins attended Trolls-themed activities in the Kids Club, our smallest one attended Royal Tots and Mom and Dad got some quality time together. Our rule of thumb is one date night for every three or four days on the road. It keeps Mom & Dad connected, invested, and gives us something to look forward to. And, even the most kid-centric vacations still feel like a break for us too. Day Four – Charlotte Amalie, St. Thomas St. Thomas was pretty, but not spectacular. In retrospect, maybe we should have ferried over to St. John. At the risk of sounding like a spoiled brat, I’ll provide this context so you can see where I’m coming from. My experience with the Caribbean isn’t extensive – Nassau, St. Thomas, St. Maarten, Grand Cayman, Honduras, Belize, Cozumel, and maybe one or two more, but I prefer Hawaii to the Caribbean by a million – it’s not even close. I think Hawaii is way more exotic, more beautiful, happier, cleaner, more spectacular beaches and sunsets, more economically stable, more magical, really better by any means of measure. Admittedly, I’m not a diver and reportedly the Caribbean has an edge in that regard, but as long as we are being candid, that’s my take. Perhaps when the kids are older and better suited to active pursuits, we’ll see a different side. And it’s still pretty and worth a visit, but if you are saving for a splurge, I’d pick Hawaii, even with the longer flight times, hands down. We chose the Coral World shore excursion which lasted about 5 hours including transportation. Part of it was a semi-submersible ride among a coral reef and we saw some pretty cool tropical fish. The kids especially liked the sawfishes. It also included access to the Underwater Enchantment and Ocean Park, where they touched starfish and sea cucumbers. It was fun. The guides were lackluster though and there were iguanas everywhere which was great (for the kids) or not great (for mom). I guess it depends on your perspective. Lol. A word of warning to the parents though about St. Thomas in general. The only means of transportation on the island besides boats is open-air, open-side trolley taxis. This means playing defense the entire ride as the drivers are driving like maniacs on bumpy windy roads and the family is sliding around on bench seating without seatbelts. THD and I were hanging on to all three of our babies for dear life. It was stressful. Day Five – Philipsburg, St. Maarten We had another early day as we selected the Butterfly Farm & Marigot as our shore excursion. We were picked up at the port in a Mercedes touring bus which was made me breathe a sigh of relief after the previous day’s ground transportation. The butterfly farm was delightful and the kids loved it, the butterflies, the little turtle they found, and the birds. Yes we wore bug spray with deet at the recommendation of our pediatrician. Sorry for the butterflies, but Zika is a concern here and we were definitely inland surrounded by forest, bugs and birds. Marigot is the duty-free shopping center of St. Maarten’s French capital. We walked/strolled a bit, but mostly just picked out macaroons. I enjoyed seeing the French and Dutch sides. Back on the ship, THD saw the Comedy Show that night and funny enough; the headliner was one of his friends from Denver. Shout out to Steve McGrew! It’s a small world, right? Day Six – Sea Day We had two travel days left and wanted to maximize the ship, so we literally tried almost every attraction and activity that we hadn’t already done. We spent a lot of time in the pools and splash park. There are water squirters, a lazy river, a self-serve soft-serve ice cream cone station, a wading pool, an adult pool, and more. What more could a happy kid ask for? The ship also provided life jackets and towels, so don’t worry about that. We also met the Trolls again and enjoyed the second of two formal nights and yes, we wore the same outfits. Packing for five is an undertaking. Now that the kids knew the drill, they were super excited. They put their napkins in their laps, ordered each course without prompting, and were really well behaved. And so so cute in their formal-wear. THM Tip: Be sure to take advantage of being dressed up together by taking lots of photos of your own, but also by stopping by the photo stations throughout the ship on formal night for special souvenirs. We booked our DreamWorks character breakfast for the last full day before disembarkation because we wanted to look forward to it all week and end on a high note. The menu was really cute, breakfast favorites renamed and themed for DreamWorks. Po and the Penguins made appearances, circulating among the tables to ensure time with each family, and performed a bit. Note: the only thing about the dining rooms that was consistently disappointing was the coffee. Rest assured there is a Starbucks onboard and we visited often, but it is an added cost. That night, after Blue Planet, the Cirque du Soleil-like show, we packed up our luggage, tucked the kids in one room (by the end of the cruise all three were sleeping in their own cabin which was delightful!) and mom and dad retired to the other cabin to finish our last bottle of wine. THM Tip: Definitely prepare for disembarkation the night before, taking advantage of setting your luggage out for express departure and download the Mobile Passport app. Then all you have to do is scan your passport and present the app to Customs/Border Patrol. Day Seven – Last Day You can choose to linger or disembark early on your last day, but we had a roadtrip to kick off, so after an early breakfast, we said our goodbyes to the ship. The kids were understandably sad, but quick to recover. I thought it also might be helpful to present the highlights of the ship, deck-by-deck, starting from the bottom to the top. Deck 3 On deck 3 was the Amber Theatre, where we (re-) watched Trolls in 3D which we all loved just as much as the first time. We also met the Poppy and Branch characters at scheduled meet and greets. The kids really enjoyed meeting the characters, the shows, the parades and more. That part was priceless. There was also an ice rink on deck 3, and THD took our son to the How To Train Your Dragon ice show one evening. One of the three main dining rooms was on deck 3 although you had to have chosen your dining time and booked it in advance. We participated in my-time-dining which means our dinners could be scheduled each day by making reservations or come as you wish to the dining room on deck five, or just eat anywhere on the ship. If you have a large group or want a specific experience, definitely pre-book your dining too. In this case, we didn’t know how exhausted the kids would be each day given our full schedules, so we appreciated the flexibility. Other than the first night at Giovanni’s Table, we only scheduled two other dinners, both on formal night. Deck Four The Amber Theatre was two floors. We also saw the Blue Planet show which was a Cirque-like show and we sat in the front row for the kiddos. It was probably a little too close. The “tree people’ were a little too scary for them. THD saw a comedy show on deck 4 and we both spent a little time and money in the casino, which was just ok, not great. Honestly, we expected more from an M Life casino, so we gambled a little less than usual, but then again, kids. Deck Five The Vitality Spa and Fitness Center was great. I took a stretch class, an ab class, and spent some time on the ellipticals. It was a great gym, and had a nice quantity of equipment and classes available. The spa seemed great too, but this wasn’t the trip for spa time. Deck 5 was where you could find the Royal Promenade too. We loved this feature. It was a street with cafes and pubs, a Starbucks (which we visited most mornings and was comforting in that way that having something familiar is), some bars, some shops, and Guest Services. Shout out to Guest Services. Our double stroller lost a very necessary bolt at some point and although the agent discussing it with us had zero idea what we were talking about, it was delivered back to the room good as new! Essential to our trip and free to fix. Thank you! Thank you! That stroller has been all over the country and then some with us and has seen its fair share of bumpy paths, off-roading, and airport handling, so I don’t know how much strolling it has in its future, but for travel, it’s lightweight, easily collapsible, and holds two tired children, so essential. We ate at Sorrento’s Pizzeria (food court quality but perfectly convenient), popped into Café Promenade a number of times (and they happily steamed milk for baby for free throughout the cruise) and we took a peek at the shops, which were underwhelming. Although I like a Kate Spade and Michael Kors bag as much as anyone, the prices seemed pretty unremarkable. Deck Six The spa/fitness center spans two decks, but the big feature of this deck is the Boardwalk and AquaTheatre. This area is so much fun for families. It has a carousel that runs mostly in the evenings, an outdoor bar, a Mexican restaurant, a Johnny Rockets (THM Tip: You can eat breakfast for free at Johnny Rockets and the Park Cafe in Central Park), some family-friendly shopping, a hot dog house, a donut shop, an ice cream shop, and an arcade. Our little ones are mostly too small for arcades, but there were a few scattered about the boat and for the older kids, I’m sure they had a blast. The AquaTheater is also on this deck. It’s where they hosted the water shows, and a sail-away party(ies). Our son even made it on the big screen when he was dancing with DreamWorks characters. Deck Seven Deck 7 is entirely rooms with the exception of two 43-foot rock climbing walls. We didn’t use them this time as our children didn’t meet the height requirements. Deck Eight Deck 8 is Central Park! This was my favorite deck. It’s a small open-air, no-roof park right in the heart of the ship and it was wonderful to be outside without being seaside (no wind) and to have a path to stroll that wasn’t so busy. They piped in cricket and night sounds in the evening and birds and day sounds in during the morning, but it wasn’t as cheesy as you’d think. There was a nice mixture of dining and cocktails in the park too. Giovanni’s Table was the Tuscan restaurant that we enjoyed on night one. The Park Café was where we picked up (free!) sandwiches and fruit several times throughout the week. There were also some fancy specialty restaurants that we did not try. 150 Central Park looked gorgeous as did the menu. Deck Nine Our connecting staterooms (CV 9243 and CV 9245) were wonderful. They overlooked Central Park with window seats, thus taking advantage of the sunshine and trees, but did not have a balcony which made Mama happy. This deck is also nearly entirely staterooms. Deck Ten All staterooms. Deck Eleven Nearly entirely staterooms. Also a library and the Diamond Club accessible to Crown & Anchor members with status. That does not include us as it was our first Royal Caribbean cruise. Deck Twelve All staterooms. Deck Thirteen Does not exist. Like some hotels and airlines, I think there’s a fear of triskaidekaphobia. Deck Fourteen Our kids loved deck 14! The Kids Club, called Adventure Ocean, is impressive. The twins loved the Aquanauts program which focused on age-appropriate activities for 3 – 5 year olds. It included an science lab where they participated in studying bugs and making volcanoes. The Imagination Studio is for crafts and art projects. The Adventure Ocean Theater was host to a children’s talent show and theatrical productions. The Workshop was a room for scrapbooking and jewelry classes. There was also a play room in which parents could supervise their children. It was nice to have an “indoor” location for the kids to run and play just to mix it up and have some out of the sun time. The Royal Babies (6-18 months) and Royal Tots (18 – 36 months) Nursery was for the littlest guests. Our two-year-old played for one three-hour block during the week while Mom & Dad had a (short) date. Still, we got a night out dancing at the club in the solarium! Each day the Kids Club would have a theme and then corresponding activities by age group. There was a morning, afternoon, and evening session that you could sign up for. All kids wear a bracelet for the duration of the cruise which lets all staff know which parents, stateroom, etc., they are connected too. It also makes it easy to deliver them to the appropriate muster station in case of emergency. We also required our three to wear their stateroom key card on a lanyard the entire week. It functions as a credit card (for Mom & Dad), a room key, a dining key, and a sign up key (for the various activities on board), etc. The kids were up to the challenge of keeping track of it all week. They hung in on a hook while in the stateroom and kept it on and safe the rest of the time. We talked about why it was important and how it connected us as a family. I was really proud of them. For those of you wondering, staff of the kids club is required to have childcare, recreation, and CPR experience, plus pass a background check. The kids club was open morning through night and many, most, of the programs are complimentary and included in your cruise fare. Deck Fifteen The Solarium was on Deck 15, an adults-only area with 10 whirlpools (with TVs which mostly featured college basketball during March Madness) that were usually oddly almost always, dining, and a beautiful glass viewing area at the front of the ship. We danced here on our date night and had some very expensive cocktails. The water park, called the H20 Zone, is also on this level. The main pool and sports area was for adults and bigger kids. I took a water aerobics class there late in the cruise that was so much fun I wished I would have taken more water classes earlier in the cruise. For the smaller kids, there was a splash park, lazy river, and wading pool. The kids loved all of it and we did too because although we still need to be close by or holding hands, they are building confidence every time. This summer we are definitely taking swimming lessons. There was also a miniature golf course that was really fun and a lot of teen areas on Deck 15. The teens were everywhere in the Living Room, the arcade, the disco, the cafes, and the sports courts with full-size basketball court (although we mostly saw the teens playing vicious games of dodgeball there!). It looked like fun. Deck Sixteen The Windjammer is the cafeteria onboard. It’s enormous as you’d expect and served buffet-style breakfast, lunches, and dinners. It wasn’t amazing. It wasn’t terrible. It was adequate and you really could find something for everyone. We stuck to the great selection of fruit and breads, had pasta a few times, skipped the seafood and most meats, and had some desserts here and there. There is also a Zip Line (82 feet across the center of the boat several stories in the air!) and the two Flowriders on this deck. Deck Seventeen Deck 17 was Suites, which sadly we did not have, and suite privileges, which include an exclusive sun deck, a private restaurant, and private lounge. Deck Eighteen Deck 18 isn’t really a deck but more just the second level for those lucky passengers on 17 who have two-story decks. THM Tips Before I conclude, I thought I’d take a minute to cover a few specific cruise tips for those of you relatively new to cruising. Definitely read my post of the definitive guide to cruising too and my guide to packing at travelhappymom.com too. Make sure to check-in online and plan as much as you can in advance. You can book dining, entertainment, lessons, spa treatments and more before you get onboard. You know what you like, what makes your vacation special, so book those things early. You’ll be so glad you did the extra work when you have pre-booked reservations to everything on-board and don’t have to wait in line to secure a spot and/or risk not getting in because it’s full. Sign any waivers in advance for the activities onboard for you and your family too. Book your shore excursions in advance and my recommendation is to book one/port. That way you’ll maximize your time in each location and have a special memory associated with each place. Yes, you can walk off the ship for free is each port and explore on your own, but all ports look the same where you dock. You need to get into town, to an attraction, or venture inland to really experience an island or city. And the most popular excursions can sell out, so book your top choices first, and then contemplate your other choices. Booking private excursions is also an option, but with little ones convenience is often worth an upcharge. We tend to book privately more often without the kids, but book exclusively with the cruise line when kids are involved. Fewer variables. Know the dining options. If there is a café, can you go anytime? Immediately after embarkation? How does the menu there differ from the main dining rooms? Is flexible dining or assigned dining better for your group? Does a specialty restaurant and/or paying extra make sense for your group? Is it worth it? Do you want to book wine and beverage packages in advance? THM Tip: We never book a beverage package. First, we don’t drink soda and don’t allow the kids to either. Second, wine never seems to be a problem. We take our two allowed bottles on board and then always end up with more bottles one way or another (usually gifted). Yes, we end up paying for a few cocktails or a beer here and there, but that’s par for the course. And you can pick up alcohol in ports too. Your SeaPass as Royal Caribbean calls it is your credit card/cabin key/ID card that you need to access anything, use for getting on and off the boat, purchasing anything, participating in activities, etc. We picked up lanyards from the kids club and attached them to our kids for the duration. Find a consistent spot to hang them in your stateroom so that you can grab it without searching every time you leave the room. Tipping is expensive, especially for a party of five. $13.50/day x 5/people x 7/days = $472.50. Get over it. It’s non-negotiable unless for some reason you have bad service or a problem. It covers dining staff, stateroom attendants (our stateroom attendant Marijana was delightful and particularly good with the kids), housekeeping services and more. There are so many crew onboard working tirelessly to take care of your family and ensure a happy vacation, so think of it as the least you can do. I try to remind myself that the crew is away from their families while they work so that we can enjoy our family on vacation. It helps keep it all in perspective. Wear something special for embarkation so all of your first day photos/selfies look great. We had coordinated anchor outfits. And, plan each day’s outfits in advance for easy packing, great pictures, and helping find each other in crowds. And, take a carry-on with pool clothes, snacks, anything you’ll want before your luggage is made available for the time period after you immediately embark. And definitely, dress for formal night. It’s rare for most families to have occasion to dress up together and it’s so much fun. Explore the ship early on. Check out the venues, open all doors (that don’t say emergency-only! ), and ask crewmembers and fellow passengers where their favorite places are/where their favorite moments are made, etc. You’ll get more of your money’s worth by taking it all in. Know if you need an international roaming plan for your cell phone/tablets. You don’t want any surprise charges when you come home. Make time to see the sunrises and sunsets all over the world!!! Disembarkation was flawless. This was particularly impressive with the volume of people onboard. We requested the earliest departure available to those who were not carrying their luggage off themselves. That meant we had to have all of our bags packed up and tagged outside our stateroom before midnight the night before so that they would be waiting for us off the ship before Customs. We also downloaded the Mobile Passport app and scanned our passports as well as filled out all documentation in advance. That was super helpful and efficient. Then after breakfast, we simply walked off and it was over. The kids were sad. I was too really. THD was excited. He was going to the Masters!! We chose this cruise specifically for three reasons: first, timing = during spring break, second, theme = Dreamworks cruise for our children&apos;s first cruise, third = price, the ship and itinerary seemed to offer more for the money than others at the same time. Here&apos;s the abbreviated review. First stop Ft. Lauderdale. Our driver picked us up promptly after collecting our bags and had three car seats already installed in the van for our drive from Miami to Ft. Lauderdale. Francisco of FG Car Services was fabulous and we used the same service from the hotel to the port a few days later, three car seats included. We checked in at the Westin Ft. Lauderdale Beach Resort at 7am and because we had already advised them about our situation, they were very accommodating about the early check-in time. In fact, they upgraded us to a corner room with larger accommodations and a pool view and a beach view, and the room was ready. One really great feature of this hotel was the beach access skywalk from the pool to the ocean which meant that the little ones didn’t have to cross the busy A1A (Beachfront Avenue!! for those of you hearing Vanilla Ice in your head). Francisco, the driver who provided our ground transportation from Miami, sent someone to pick us up on Sunday morning and drop us at Port Everglades. We paid $150 for both services, plus tip. It may seem like a lot, but it turned out to be a bargain, because on both rides, three car seats were included and already installed, which is always a dilemma when traveling with little ones. And, our timing was challenging, considering we arrived at 6:05am on Thursday morning at MIA and our hotel and the port were in FLL. Then, on Sunday morning at the port, the driver knew some super-secret-shortcut that bypassed the long long long line of fellow cruise passengers. He dropped us off right where we checked our luggage and all we had to do was walk into customs. It was very convenient, especially when schlepping 3 kids and 3 bags, so all in all, money well spent. Royal Caribbean’s Allure of the Seas 7-night Eastern Caribbean. Check in was long, but not terrible. Royal Caribbean’s Allure of the Seas, is after all, the second largest cruise ship in the world. There were some 4,000 – 7,000 passengers and crew to board, including us. We were very lucky to have two connecting rooms. We probably wouldn’t have had nearly as much fun crammed into one. Doable, yes, but with three little ones, not such a pleasure. Definitely check out this ship’s reviews online and keep reading for my deck-by-deck description. It’s incredible. 18 decks, 7 “neighborhoods”, and 25 dining options. We chose it as our first family cruise specifically for the children’s features. It was a DreamWorks-themed ship. Think Disney experience, but substitute the DreamWorks characters. We did it all and want to share it all so that you truly know if it’s right for your family. So, the review: we know the children are at the ideal age for interacting with characters because Disneyland and Disneyworld are two of their very favorite places on the planet. And, because the DreamWorks movies are some of their favorites too, we took a chance. It paid off. They met Shrek and Fiona and Puss in Boots, as well as the Penguins, Alex the Lion, Gloria the Hippo, and King Julian from Madagascar. They met Po from Kung Fu Panda and saw Toothless and Hiccup and Stoic and Astrid from How to Train Your Dragon. We paid a small upcharge for the character breakfast and they loved the menu and the extended time with the characters. There were two fantastic parades during the week, one at the beginning of the cruise and one near the end. THM Tip: Don’t miss the parades. Definitely camp out on the level above the parade in the Focus photo gallery at the top of the spiral staircase on deck six if it’s available. It offers a prime vantage point where you can see the parade from from one end to the other. There were character meet-and-greets during most days onboard at several times throughout the day. THM Tip: Request information in advance for your favorite characters. For example, we were given the two times Poppy and Branch would appear, and we took full advantage of that insider information so that we could be first in line both times and it was worth it. There was a movie theater onboard which showed many DreamWorks movies in 3D and there was a DreamWorks channel in the stateroom which showed DW programming in a continuous loop. That was a big deal during rest time. We attended the Madagascar Aqua Show and the How to Train Your Dragon Ice Show. All of these activities were perfect for our children and greatly added to the value of the cruise. Like visiting a Disney park, it’s expensive, but totally lives up to the hype. It’s so worth it as they are only little once. We were onboard by about 2-something-pm, which meant the whole check-in rigmarole took a couple of hours. Not bad. The kids know travel security is serious business and handled it all pretty well. THM Tip: Do as much prep as possible about the boat, about your itinerary, about the boarding process, etc. You must complete all documentation in advance. You’ll be glad you did. You need passports for every member of your family and you need reservations in advance to the shore excursions, dining, and activities that are your top choices. There are simply too many people onboard to “wing it”. We didn’t notice the volume of people or feel competitive at any time, but again, we had our game plan thoroughly mapped out in advance. We signed up for First Night Done Right, which is basically a way to pre-book your first night’s specialty dining at a discounted rate. We were matched with Giovanni’s Table, an Italian restaurant in Central Park. Yes, Central Park, by far, my favorite feature of the ship. On deck 8, there was a real open-air park, complete with trees and a path for strolling among the specialty restaurants and shops. Our connecting cabins overlooked the park from deck 9, where we had category CV, Central Park View Staterooms. It was delightful to be able to have natural light in the cabin, but not a balcony (by design as this mama didn’t want to be on high-alert at all times about her little monkeys), and overlooking the park was such a treat. The kiddos enjoyed the window seats too. I thought the park would feel more gimmicky than it did and even though it did have park sounds piped in, it was still a pleasant surprise all around. So was Gionvanni’s. It was our only specialty restaurant (which meant an extra charge), but it was worth it. With little kids, we don’t always get out money’s worth at expensive restaurants, but it was so nice to discover the park the first night and enjoy a special meal without having to figure out the cafeteria or main dining situation. Before dinner, we explored the ship, toured the kids club, and signed the kids up for classes and babysitting, two things you are required to book onboard. We booked the Atlantis shore excursion for the family. This was a reconnaissance tour as we are considering a multi-generational family trip to Atlantis and wanted to know if it makes the cut. It did and didn’t. In short, I think it would be a great fit for teens (lots and lots and lots of water action) and gamblers, but others might get a little bored after a couple of days. It’s basically a super-sized Vegas casino, but on an island instead of the strip. Shuttles picked us up at the port and dropped us off at Atlantis where we had a guide to the resort and about a 3 ½ hour tour which included the archaeological ruins, the underwater tunnel, and the marine life. We brought the strollers so all three could ride and they enjoyed it. It was a lot of walking so keep that in mind if you have mobility issues. The guide was really great and picked the twins to be the leader of our group of about 20 so they got a kick out of rushing to the front each time. We didn’t opt in for waterpark access this time as they are a bit too small for the dramatic water slides and deep water. It looked really fun though. It was hot, but not too hot, and it was a nice mix of indoor and outdoor sightseeing. That evening and back onboard the ship, it was formal night. THM was excited because our son would be wearing his first tuxedo ever (ordered from Zulily) and the girls had matching black gowns with gold swans (from Target). They were so cute and loved dressing up! We thought it could go either way, but all three loved the attention and the special-occasion-feel of the evening. We reported to the American Icon main dining room on deck three, but they upgraded us to the fifth-floor dining. The main dining spans three floors and you are assigned one, but all have a slightly different appeal. Service and menus are standardized. A dining aside: We participated in My Time Dining. This means we didn’t have a set time or table to dine at each night (which would be necessary if you were a big group). We appreciated the flexibility for the kiddos and never had a long wait. We also enjoyed trying different options and eating when it suited our itinerary. We had the same maître de on some nights and they were accommodating to the children. While THD put the twins to bed, the little one and I went to Mamma Mia! She wasn’t 100% convinced she liked cruising by this point and would not let Mama go alone, so I didn’t see the entire show (only about a third of it really before she lost interest), but it was fun. Nice production value, strong voices, and a fun high-quality performance. I would have liked to see the entire production. It was nice to sleep in after the previous day’s early start and full agenda, so we ate and explored the ship some more. I shopped a bit and popped into the casino. The casino was a bit underwhelming. It had your usual mix of slots and table games, but there wasn’t a lot of energy or excitement the times I dropped in. Although I did see a woman win $1,300 and was very excited for her! All five of us watched the Trolls movie in 3D and loved it just as much as we did back home and when we got to meet Poppy & Branch later that day, it was the icing on the cake. That evening while the twins attended Trolls-themed activities in the Kids Club, our smallest one attended Royal Tots and Mom and Dad got some quality time together. Our rule of thumb is one date night for every three or four days on the road. It keeps Mom & Dad connected, invested, and gives us something to look forward to. And, even the most kid-centric vacations still feel like a break for us too. St. Thomas was pretty, but not spectacular. In retrospect, maybe we should have ferried over to St. John. At the risk of sounding like a spoiled brat, I’ll provide this context so you can see where I’m coming from. My experience with the Caribbean isn’t extensive – Nassau, St. Thomas, St. Maarten, Grand Cayman, Honduras, Belize, Cozumel, and maybe one or two more, but I prefer Hawaii to the Caribbean by a million – it’s not even close. I think Hawaii is way more exotic, more beautiful, happier, cleaner, more spectacular beaches and sunsets, more economically stable, more magical, really better by any means of measure. Admittedly, I’m not a diver and reportedly the Caribbean has an edge in that regard, but as long as we are being candid, that’s my take. Perhaps when the kids are older and better suited to active pursuits, we’ll see a different side. And it’s still pretty and worth a visit, but if you are saving for a splurge, I’d pick Hawaii, even with the longer flight times, hands down. We chose the Coral World shore excursion which lasted about 5 hours including transportation. Part of it was a semi-submersible ride among a coral reef and we saw some pretty cool tropical fish. The kids especially liked the sawfishes. It also included access to the Underwater Enchantment and Ocean Park, where they touched starfish and sea cucumbers. It was fun. The guides were lackluster though and there were iguanas everywhere which was great (for the kids) or not great (for mom). I guess it depends on your perspective. Lol. A word of warning to the parents though about St. Thomas in general. The only means of transportation on the island besides boats is open-air, open-side trolley taxis. This means playing defense the entire ride as the drivers are driving like maniacs on bumpy windy roads and the family is sliding around on bench seating without seatbelts. THD and I were hanging on to all three of our babies for dear life. It was stressful. We had another early day as we selected the Butterfly Farm & Marigot as our shore excursion. We were picked up at the port in a Mercedes touring bus which was made me breathe a sigh of relief after the previous day’s ground transportation. The butterfly farm was delightful and the kids loved it, the butterflies, the little turtle they found, and the birds. Yes we wore bug spray with deet at the recommendation of our pediatrician. Sorry for the butterflies, but Zika is a concern here and we were definitely inland surrounded by forest, bugs and birds. Marigot is the duty-free shopping center of St. Maarten’s French capital. We walked/strolled a bit, but mostly just picked out macaroons. I enjoyed seeing the French and Dutch sides. Back on the ship, THD saw the Comedy Show that night and funny enough; the headliner was one of his friends from Denver. Shout out to Steve McGrew! It’s a small world, right? We had two travel days left and wanted to maximize the ship, so we literally tried almost every attraction and activity that we hadn’t already done. We spent a lot of time in the pools and splash park. There are water squirters, a lazy river, a self-serve soft-serve ice cream cone station, a wading pool, an adult pool, and more. What more could a happy kid ask for? The ship also provided life jackets and towels, so don’t worry about that. We also met the Trolls again and enjoyed the second of two formal nights and yes, we wore the same outfits. Packing for five is an undertaking. Now that the kids knew the drill, they were super excited. They put their napkins in their laps, ordered each course without prompting, and were really well behaved. And so so cute in their formal-wear. THM Tip: Be sure to take advantage of being dressed up together by taking lots of photos of your own, but also by stopping by the photo stations throughout the ship on formal night for special souvenirs. We booked our DreamWorks character breakfast for the last full day before disembarkation because we wanted to look forward to it all week and end on a high note. The menu was really cute, breakfast favorites renamed and themed for DreamWorks. Po and the Penguins made appearances, circulating among the tables to ensure time with each family, and performed a bit. Note: the only thing about the dining rooms that was consistently disappointing was the coffee. Rest assured there is a Starbucks onboard and we visited often, but it is an added cost. That night, after Blue Planet, the Cirque du Soleil-like show, we packed up our luggage, tucked the kids in one room (by the end of the cruise all three were sleeping in their own cabin which was delightful!) and mom and dad retired to the other cabin to finish our last bottle of wine. THM Tip: Definitely prepare for disembarkation the night before, taking advantage of setting your luggage out for express departure and download the Mobile Passport app. Then all you have to do is scan your passport and present the app to Customs/Border Patrol. You can choose to linger or disembark early on your last day, but we had a roadtrip to kick off, so after an early breakfast, we said our goodbyes to the ship. The kids were understandably sad, but quick to recover. I thought it also might be helpful to present the highlights of the ship, deck-by-deck, starting from the bottom to the top. On deck 3 was the Amber Theatre, where we (re-) watched Trolls in 3D which we all loved just as much as the first time. We also met the Poppy and Branch characters at scheduled meet and greets. The kids really enjoyed meeting the characters, the shows, the parades and more. That part was priceless. There was also an ice rink on deck 3, and THD took our son to the How To Train Your Dragon ice show one evening. One of the three main dining rooms was on deck 3 although you had to have chosen your dining time and booked it in advance. We participated in my-time-dining which means our dinners could be scheduled each day by making reservations or come as you wish to the dining room on deck five, or just eat anywhere on the ship. If you have a large group or want a specific experience, definitely pre-book your dining too. In this case, we didn’t know how exhausted the kids would be each day given our full schedules, so we appreciated the flexibility. Other than the first night at Giovanni’s Table, we only scheduled two other dinners, both on formal night. The Amber Theatre was two floors. We also saw the Blue Planet show which was a Cirque-like show and we sat in the front row for the kiddos. It was probably a little too close. The “tree people’ were a little too scary for them. THD saw a comedy show on deck 4 and we both spent a little time and money in the casino, which was just ok, not great. Honestly, we expected more from an M Life casino, so we gambled a little less than usual, but then again, kids. The Vitality Spa and Fitness Center was great. I took a stretch class, an ab class, and spent some time on the ellipticals. It was a great gym, and had a nice quantity of equipment and classes available. The spa seemed great too, but this wasn’t the trip for spa time. Deck 5 was where you could find the Royal Promenade too. We loved this feature. It was a street with cafes and pubs, a Starbucks (which we visited most mornings and was comforting in that way that having something familiar is), some bars, some shops, and Guest Services. Shout out to Guest Services. Our double stroller lost a very necessary bolt at some point and although the agent discussing it with us had zero idea what we were talking about, it was delivered back to the room good as new! Essential to our trip and free to fix. Thank you! Thank you! That stroller has been all over the country and then some with us and has seen its fair share of bumpy paths, off-roading, and airport handling, so I don’t know how much strolling it has in its future, but for travel, it’s lightweight, easily collapsible, and holds two tired children, so essential. We ate at Sorrento’s Pizzeria (food court quality but perfectly convenient), popped into Café Promenade a number of times (and they happily steamed milk for baby for free throughout the cruise) and we took a peek at the shops, which were underwhelming. Although I like a Kate Spade and Michael Kors bag as much as anyone, the prices seemed pretty unremarkable. The spa/fitness center spans two decks, but the big feature of this deck is the Boardwalk and AquaTheatre. This area is so much fun for families. It has a carousel that runs mostly in the evenings, an outdoor bar, a Mexican restaurant, a Johnny Rockets (THM Tip: You can eat breakfast for free at Johnny Rockets and the Park Cafe in Central Park), some family-friendly shopping, a hot dog house, a donut shop, an ice cream shop, and an arcade. Our little ones are mostly too small for arcades, but there were a few scattered about the boat and for the older kids, I’m sure they had a blast. The AquaTheater is also on this deck. It’s where they hosted the water shows, and a sail-away party(ies). Our son even made it on the big screen when he was dancing with DreamWorks characters. Deck 7 is entirely rooms with the exception of two 43-foot rock climbing walls. We didn’t use them this time as our children didn’t meet the height requirements. Deck 8 is Central Park! This was my favorite deck. It’s a small open-air, no-roof park right in the heart of the ship and it was wonderful to be outside without being seaside (no wind) and to have a path to stroll that wasn’t so busy. They piped in cricket and night sounds in the evening and birds and day sounds in during the morning, but it wasn’t as cheesy as you’d think. There was a nice mixture of dining and cocktails in the park too. Giovanni’s Table was the Tuscan restaurant that we enjoyed on night one. The Park Café was where we picked up (free!) sandwiches and fruit several times throughout the week. There were also some fancy specialty restaurants that we did not try. 150 Central Park looked gorgeous as did the menu. Our connecting staterooms (CV 9243 and CV 9245) were wonderful. They overlooked Central Park with window seats, thus taking advantage of the sunshine and trees, but did not have a balcony which made Mama happy. This deck is also nearly entirely staterooms. Nearly entirely staterooms. Also a library and the Diamond Club accessible to Crown & Anchor members with status. That does not include us as it was our first Royal Caribbean cruise. Does not exist. Like some hotels and airlines, I think there’s a fear of triskaidekaphobia. Our kids loved deck 14! The Kids Club, called Adventure Ocean, is impressive. The twins loved the Aquanauts program which focused on age-appropriate activities for 3 – 5 year olds. It included an science lab where they participated in studying bugs and making volcanoes. The Imagination Studio is for crafts and art projects. The Adventure Ocean Theater was host to a children’s talent show and theatrical productions. The Workshop was a room for scrapbooking and jewelry classes. There was also a play room in which parents could supervise their children. It was nice to have an “indoor” location for the kids to run and play just to mix it up and have some out of the sun time. The Royal Babies (6-18 months) and Royal Tots (18 – 36 months) Nursery was for the littlest guests. Our two-year-old played for one three-hour block during the week while Mom & Dad had a (short) date. Still, we got a night out dancing at the club in the solarium! Each day the Kids Club would have a theme and then corresponding activities by age group. There was a morning, afternoon, and evening session that you could sign up for. All kids wear a bracelet for the duration of the cruise which lets all staff know which parents, stateroom, etc., they are connected too. It also makes it easy to deliver them to the appropriate muster station in case of emergency. We also required our three to wear their stateroom key card on a lanyard the entire week. It functions as a credit card (for Mom & Dad), a room key, a dining key, and a sign up key (for the various activities on board), etc. The kids were up to the challenge of keeping track of it all week. They hung in on a hook while in the stateroom and kept it on and safe the rest of the time. We talked about why it was important and how it connected us as a family. I was really proud of them. For those of you wondering, staff of the kids club is required to have childcare, recreation, and CPR experience, plus pass a background check. The kids club was open morning through night and many, most, of the programs are complimentary and included in your cruise fare. The Solarium was on Deck 15, an adults-only area with 10 whirlpools (with TVs which mostly featured college basketball during March Madness) that were usually oddly almost always, dining, and a beautiful glass viewing area at the front of the ship. We danced here on our date night and had some very expensive cocktails. The water park, called the H20 Zone, is also on this level. The main pool and sports area was for adults and bigger kids. I took a water aerobics class there late in the cruise that was so much fun I wished I would have taken more water classes earlier in the cruise. For the smaller kids, there was a splash park, lazy river, and wading pool. The kids loved all of it and we did too because although we still need to be close by or holding hands, they are building confidence every time. This summer we are definitely taking swimming lessons. There was also a miniature golf course that was really fun and a lot of teen areas on Deck 15. The teens were everywhere in the Living Room, the arcade, the disco, the cafes, and the sports courts with full-size basketball court (although we mostly saw the teens playing vicious games of dodgeball there!). It looked like fun. The Windjammer is the cafeteria onboard. It’s enormous as you’d expect and served buffet-style breakfast, lunches, and dinners. It wasn’t amazing. It wasn’t terrible. It was adequate and you really could find something for everyone. We stuck to the great selection of fruit and breads, had pasta a few times, skipped the seafood and most meats, and had some desserts here and there. There is also a Zip Line (82 feet across the center of the boat several stories in the air!) and the two Flowriders on this deck. Deck 17 was Suites, which sadly we did not have, and suite privileges, which include an exclusive sun deck, a private restaurant, and private lounge. Deck 18 isn’t really a deck but more just the second level for those lucky passengers on 17 who have two-story decks. Before I conclude, I thought I’d take a minute to cover a few specific cruise tips for those of you relatively new to cruising. Definitely read my post of the definitive guide to cruising too and my guide to packing at travelhappymom.com too. Make sure to check-in online and plan as much as you can in advance. You can book dining, entertainment, lessons, spa treatments and more before you get onboard. You know what you like, what makes your vacation special, so book those things early. You’ll be so glad you did the extra work when you have pre-booked reservations to everything on-board and don’t have to wait in line to secure a spot and/or risk not getting in because it’s full. Sign any waivers in advance for the activities onboard for you and your family too. Book your shore excursions in advance and my recommendation is to book one/port. That way you’ll maximize your time in each location and have a special memory associated with each place. Yes, you can walk off the ship for free is each port and explore on your own, but all ports look the same where you dock. You need to get into town, to an attraction, or venture inland to really experience an island or city. And the most popular excursions can sell out, so book your top choices first, and then contemplate your other choices. Booking private excursions is also an option, but with little ones convenience is often worth an upcharge. We tend to book privately more often without the kids, but book exclusively with the cruise line when kids are involved. Fewer variables. Know the dining options. If there is a café, can you go anytime? Immediately after embarkation? How does the menu there differ from the main dining rooms? Is flexible dining or assigned dining better for your group? Does a specialty restaurant and/or paying extra make sense for your group? Is it worth it? Do you want to book wine and beverage packages in advance? THM Tip: We never book a beverage package. First, we don’t drink soda and don’t allow the kids to either. Second, wine never seems to be a problem. We take our two allowed bottles on board and then always end up with more bottles one way or another (usually gifted). Yes, we end up paying for a few cocktails or a beer here and there, but that’s par for the course. And you can pick up alcohol in ports too. Your SeaPass as Royal Caribbean calls it is your credit card/cabin key/ID card that you need to access anything, use for getting on and off the boat, purchasing anything, participating in activities, etc. We picked up lanyards from the kids club and attached them to our kids for the duration. Find a consistent spot to hang them in your stateroom so that you can grab it without searching every time you leave the room. Tipping is expensive, especially for a party of five. $13.50/day x 5/people x 7/days = $472.50. Get over it. It’s non-negotiable unless for some reason you have bad service or a problem. It covers dining staff, stateroom attendants (our stateroom attendant Marijana was delightful and particularly good with the kids), housekeeping services and more. There are so many crew onboard working tirelessly to take care of your family and ensure a happy vacation, so think of it as the least you can do. I try to remind myself that the crew is away from their families while they work so that we can enjoy our family on vacation. It helps keep it all in perspective. Wear something special for embarkation so all of your first day photos/selfies look great. We had coordinated anchor outfits. And, plan each day’s outfits in advance for easy packing, great pictures, and helping find each other in crowds. And, take a carry-on with pool clothes, snacks, anything you’ll want before your luggage is made available for the time period after you immediately embark. And definitely, dress for formal night. It’s rare for most families to have occasion to dress up together and it’s so much fun. Explore the ship early on. Check out the venues, open all doors (that don’t say emergency-only! ), and ask crewmembers and fellow passengers where their favorite places are/where their favorite moments are made, etc. You’ll get more of your money’s worth by taking it all in. Know if you need an international roaming plan for your cell phone/tablets. You don’t want any surprise charges when you come home. Make time to see the sunrises and sunsets all over the world!!! Disembarkation was flawless. This was particularly impressive with the volume of people onboard. We requested the earliest departure available to those who were not carrying their luggage off themselves. That meant we had to have all of our bags packed up and tagged outside our stateroom before midnight the night before so that they would be waiting for us off the ship before Customs. We also downloaded the Mobile Passport app and scanned our passports as well as filled out all documentation in advance. That was super helpful and efficient. Then after breakfast, we simply walked off and it was over. The kids were sad. I was too really. THD was excited. He was going to the Masters!! We loved having adjoining rooms for the five of us. Early in the cruise, mom slept with the girls and dad slept with our son. 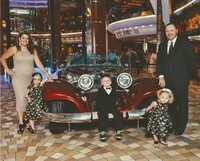 By the end of the cruise, the three little ones were in one room and mom and dad got to enjoy the other cabin! We loved the window seats overlooking Central Park. It also meant natural sunlight everyday. We also loved not having a balcony or being on the windy (sea) side of the ship. We checked in at the Westin Ft. Lauderdale Beach Resort at 7am and because we had already advised them about our situation, they were very accommodating about the early check-in time. In fact, they upgraded us to a corner room with larger accommodations and a pool view and a beach view, and the room was ready. One really great feature of this hotel was the beach access skywalk from the pool to the ocean which meant that the little ones didn’t have to cross the busy A1A (Beachfront Avenue!! for those of you hearing Vanilla Ice in your head). There were also towels and chairs and umbrellas available for hotel guests. It’s a beautiful beach. And bonus, there’s a playground on the beach too. This was our first time at this property. During our last two visits, we stayed at the Ritz and the W, both on the same section of beach, so if you are deciding between the three, I’ll offer the briefest comparison. The Westin is the best choice for families, hands down. Great beach access as mentioned, good pool, Starbucks right next to the gym in the bottom of the South tower, where we stayed, a yummy beachfront restaurant, and a great staff. The W is a little hipper and sassier and better for couples than families, better pool too. The Ritz is more luxurious at a more premium price, with better dining. Really, all three are good choices on a beautiful beach, walkable to a ton of shops and restaurants, and a water taxi from everything else. Definitely do the water taxi. It’s fun to see the homes and boats, each bigger than the last, and the kids loved the novelty of it all. THM Tip: I wouldn’t rent a car if you can avoid it. Parking is expensive everywhere, including the hotels, and for us, the less car time, the more it feels like vacation. Siren’s Table is inside the Westin, with a beachfront view, and we were pleasantly surprised. We also dined one evening at Casablanca, a cool Mediterranean-American restaurant down the block also with ocean views, in a historic former residence built in 1927. Our only true “kids choice” was Bubba Gump, a tourist family staple. Burloch Coast is in the Ritz and delicious with another oceanfront view. For sure order the Rita Lavender made from tequila, lime, lemon, lavender, orange liqueur, and salt froth. There is something super satisfying about slurping on salt froth while watching the waves. Tsukuro was basically a club I think, lol, and yes, we took the kids, but it was mid-afternoon. We walked to Las Olas Boulevard one day, which is about a two-mile-walk and took the water taxi back. It was a nice walk, past the marina, past the Isles which are rows and rows of canals where the houses and boats turn into mansions and yachts, and over a large bridge with a beautiful vantage point, so it was a fun walk for all of us. And yes, we had a stroller for the kiddos. For this trip, we packed a single and a double. We knew we wouldn’t have room on the ship for a triple or quad, and although sometimes we rent instead of bringing ours, this wasn’t that trip because we had too many destinations that required them. There is no way little kids could have made the Las Olas walk or even some of the beach walks without the strollers. St. Thomas was pretty, but not spectacular. In retrospect, maybe we should have ferried over to St. John. We chose the Coral World shore excursion which lasted about 5 hours including transportation. Part of it was a semi-submersible ride among a coral reef and we saw some pretty cool tropical fish. The kids especially liked the sawfishes. It also included access to the Underwater Enchantment and Ocean Park, where they touched starfish and sea cucumbers. It was fun. The guides were lackluster though and there were iguanas everywhere which was great (for the kids) or not great (for mom). I guess it depends on your perspective. Lol. A word of warning to the parents though about St. Thomas in general. The only means of transportation on the island besides boats is open-air, open-side trolley taxis. This means playing defense the entire ride as the drivers are driving like maniacs on bumpy windy roads and the family is sliding around on bench seating without seatbelts. THD and I were hanging on to all three of our babies for dear life. It was stressful.